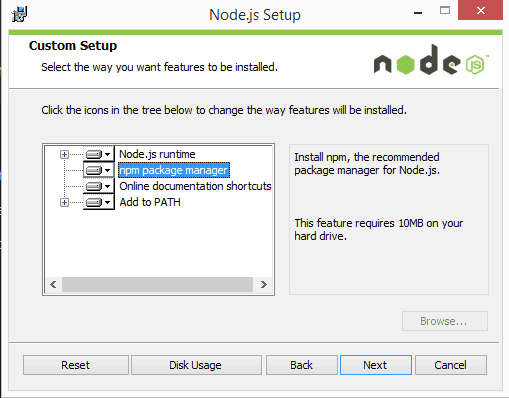 In a previous article, I wrote about how to install Node.js® and, it’s companion, NPM on a Mac. Fortunately, for Windows users, the Node.js® installation process is a lot easier than how I recommend installing Node.js® on a Mac. With Node.js and NPM installed you’ll soon be able to take advantage of the huge world of NPM modules that can help with a wide variety of tasks both on the web server and on your desktop (or laptop) machine. The NPM site lists all of the official Node packages making it easy to make the choice. Have fun! Free Talk: From the Modern Web Conference "Getting Git"
Very helpful for me to start with ReactJs. Thanks a ton Dave. Thanks a ton for this Dave.. Big help. I’m torn being a web dev student because I love BOTH windows AND mac… and before this I had to basically ignore my practically brand new windows laptop that has a bigger screen and keyboard than my wife’s mac. Now I can use my favorite machine again at home when Im working on projects, and she can get back to having her laptop back at night time when she is trying to unwind from work! Thanks for the Session.Its Useful for me!!! is this a problem? how can i fix it? npm WARN PIBM-202 No repository field. npm WARN PIBM-202 No license field. There’s no need to restart your computer. You need only close & reopen your command prompt window (to update $PATH). Hi, using sublime text. When I paste the code: console,log(‘Node is installed!’); in the editor and try to save it in C: where node folder lives, I meet an error which states that I am not permitted to install a file in that folder and yet I am in in the admin account..
You just made my day, lol. I’m a newbie at all this, but I can still sometimes help troubleshoot. My interest is that I’m seeing at least a couple people who appear to be having your same problem. By coincidence, I played in Windows this past week. It actually has *too much* admin rights for my comfort. Yet there you are as #3 now not being able to do something while those permissions are in place. You said your node folder is under C:\. Have you been able to do other things without extra effort before now and in that folder path specifically? Or did you have to take the extra step of going through an “Administrative Tools” chain of command to accomplish things in that directory? No, I don’t know anything beyond to ask that right now. My thought is that maybe that detail will help others help you diagnose. It’s interesting that you’re experiencing this right NOW and so are those one or two others elsewhere yet still others are moving right on along without a problem. The two or so I’m remembering were having problems deleting under that directory path, but theirs may only have been an issue of timing a work-around deletion fix while npm was performing some actions. You have a comma instead of a period. npm WARN admin No repository field. npm WARN admin No license field. im trying to update node js because I need it to install appcelerator studio, but when I update it to version 6.+ using install file from nodejs.org node -v still outputs 0.10.17. Been talking to appcelerator support for ever a week but they seem to go around in a circle and have no idea what the problem is. Any ideas as to why nodejs isn’t updating properly? Why Is it I am getting this error? John D, check that you didn’t copy/paste from the comments section. The font used in the comments is converting to curly-quotes. The Syntax Error may not like the single-curly-quotes around your `console.log(‘msg’)` message. Thanks for sharing! Excellent article! Your environment has been set up for using Node.js 6.11.2 (x64) and npm. Actually the hello.js file doesn’t located on “C:\Users\Cristina\”. You can switch your directory which holds the hello.js file by using this cmd “cd your-directory-name-here” or you can paste the hello.js file into “C:\Users\Cristina” directory.After that type “node hello.js”. Lets have fun! and happy coding! I had the same problem today. I found that when we open the file in any text editor and save it ‘hello.js’ the extension of the file is still ‘hello.js.txt’. So when we run the Node hello.js it can’t recognise as java script file. To resolve this open the file and save it as ‘hello.js’. You can the some logo on the file like “S”. Run again the command ‘Node hello.js’. It did resolve the problem. Below message will be show. So, the issue is that you try to npm install in the system32 folder, which does not contain a package.json file. you do not want to be in the system32 folder. What you should do, for example, is navigate to your desktop, create a new project folder or enter an existing project. If you create a new project folder, enter it and type npm init. This will create a default package.json. After this, type npm install –save where module name is the name of a module you would like to install. Suppose you are planning on building an API with the express module, you would type npm install express –save. This will not only download and install express into your node_modules folder, but the –save will also write it to your package.json file for future reference. excellent article- thanks for sharing! on your cmd line without actually creating a hello.js file. – Create the hello.js file by opening any text editor. npm ERR! network In most cases you are behind a proxy or have bad network settin gs. Hi. What is th issue below please? ANOMALY? These Anomaly errors are actually being caused by something else in your system. I have found that on mine, they are due to Java applets running in my browser. It is completely unrelated to node. How do you sidestep the “specified path is too long” error when the installer reaches npm? You should set the root installation path to a “shorter” one. Hey! Great article, but I have a question: Do you know, is possible to install and use npm without Node.js? Thanks for your help. Hi , i want to install node js using command prompt . Is it possible to install it from command line ? Not possible unless you can download a file. You might be able to use http://ftp.exe. I need to apply validation for a spring form in jsp using node.js. Can you tell me how do I work with Node.js server in hybris environment? Thanks a lot. You saved lots of my time. What’s the difference between installing the runtime and npm package manager ? – Everything work according to mention in above article and I am able run TEST too. I can check version of npm and node by ‘node -v’ and ‘npm -v’ commands but when i start ‘npm start’ its giving below error. And localhost:3001 is not working. I tried localhost:8080, localhost:3000 too but nothing working. I’m having the same problem on windows 10 pro can you help me fix it? change the folder direction, i mean node -v, and node npm -v can run when you open the cmd windows but you need to run the file from his direction Ex: cd C:\User\User_ADMIN\Downloads and then you can write, node hello.js. it works for me. same problem. please give the solution for it. Did anyone found solution as I am using Windows10 and node (v4.5.0 and latest version as well) and npm(V2.15.9 and latest version as well). I am getting below error…. This error will go away once u restart the machine. Very clear and simple explanation. Is it possible to install node.js from the windows command prompt? I want to create a script which when ran will install node.js, as well as all of the other tools require for grunt to work. The reason for this is to create a library which takes no coding knowledge to install and the library requires grunt. You don’t really need to restart your computer if you manually add the node’s directory (something like “c:\Program Files\nodejs”) to your path. Good one, however let me add 1 cent here. find External Tools and add the path to the folder where node.exe is located at. MSI (c) (48:84) [14:49:27:138]: Windows Installer installed the product. Product Name: Node.js. Product Version: 6.2.0. Product Language: 1033. Manufacturer: Node.js Foundation. Installation success or error status: 1603. MSI (c) (48:84) [14:49:27:138]: Grabbed execution mutex. Could you please suggest me how can i overcome this error. Shows how to run an installer. Hi Steward! As this is an article for early last year, we’d recommend asking your question in the Treehouse Community for a fast response as students and teachers are always happy to help there. i placed the .js in the user/username/ folder but still i am getting.. the below error. please guide me in removing this error. Hi i can’t install my windows 7 system. every time come this error message. Node.js Setup Wizard ended prematurely because of an error. Your system has not been modified. To install this program at a later time, run Setup Wizard again. Click the Finish button to exit the Setup Wizard. Hi Anand, as this is an older article, I’d recommend posting your question in the Treehouse Community where Treehouse students and teachers are always happy to help! installer aborted right away saying I had a newer version installed. Yes, but I couldn’t find it to remove it. It didn’t work and wanted to install another version. Path was no help in finding it. node -v didn’t work. File explorer search didn’t find it. I made a lucky guess and it worked; but, luck isn’t the way to go. It didn’t show up in PROGRAM and FEATURES for uninstall. Great. Finally someone has described the entry for using node.js complete and understandable. Thank you. Great article. Straightforward and effective. I ran the installer, then tried installing the fs package. I ended up with a brace of warning messages mentioning environment variables and missing Readme files. Surely this shouldn’t happen if the software installed correctly? Instruction was simple and easy to set up node and npm. I attempted to update Node and NPM by downloading the new installer Stable I’ve downloaded an installed 5.4.0 yet my NPM version remains at 2.13.3 (it should be 3+). I insured the old NPM was removed from the PATH environment variable. Something is amiss. KrojamSoft FilesSearch Tool helped me in this case. I’ve just written my first line of js code, ran it, and it said, “Node is installed!”. Thanks a million for this very precise how-to. Thanks a lot for these simple, step-by-step instructions and validations. helped me big time! Hi, i need to install node as Aptana Studio requires it. Do you have any idea what to do with it? Excellent sir. Well explained and point wise description. We survive in this industry due to people like you. Headsup. keep watching you sir. Error in adduser, why it’s connecting to 127.0.0.1:80? I just installed Node.js and npm won’t allow me to adduser. FYI, we have WebSense installed in our company and uses a self-sign root cert, but no proxy. ; ‘npm config ls -l’ to show all defaults. It seems I am having the same issue on Win7 Pro lately. Do you have any suggestions for a fix to try out? thaku you very much , really helpful. This is the what i wanted to understand. It’s clear. Thank you Dave! This works ! Thank You! For the NodeJS MSI, it looks like you just want https://nodejs.org/ now, rather than the /downloads page which gives you links for EXEs, nightlies, etc. go to release folder and choose the latest version ..
Download MSI file(node-v4.1.1-x86.msi) to install node.js in windows. 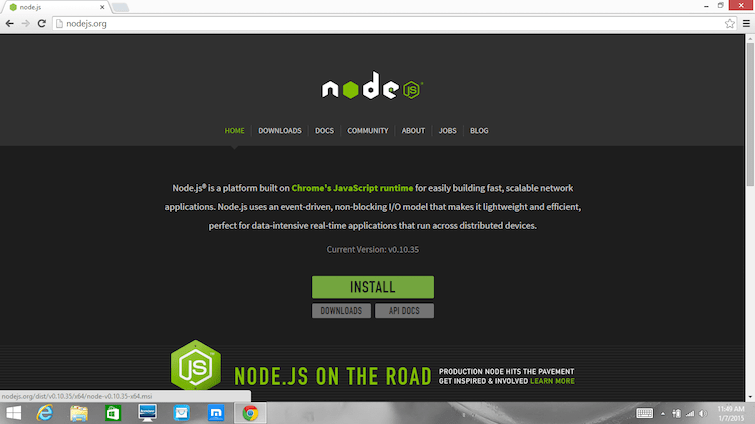 below is the sample url to download the latest version of nodejs. Duh. Read the directions. Read the error. I am also getting the same error. did you get any workaround for this. You need to move to the folder where the hello.js file is created. 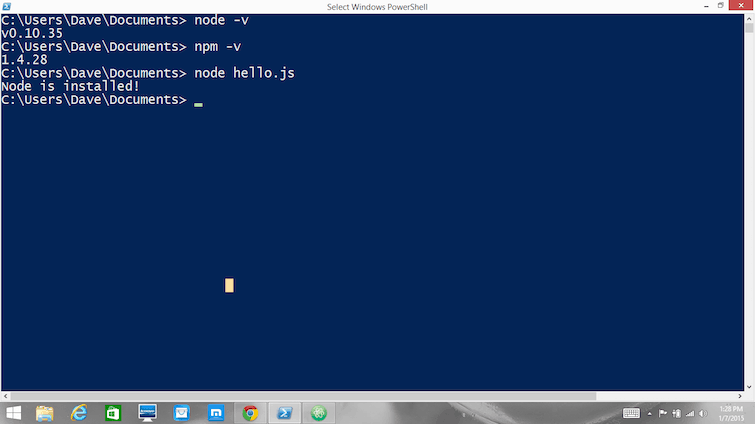 When I using node hello.js command on command prompt. hello.js is open in dreamweaver. Kindly give me solustion node version and npm version showing properly. I am using 32 bit Windows 7 and downloaded x86 msi and installed it. Just entering hello.js makes Windows evaluate the file name suffix (.js) and start the connected program, Dreamweaver in your case. The command should be: node hello.js. Now node is started, node will process hello.js. Thank you very much. This help me a lot. Thank you very much. This was very much useful. Good for install Zero ! IMHO, better samples for minimize learning curve are real applications with full source code and good patterns&practices. Thanks for this article, really helpful. Could I kjow what you do to attract neew users to your site? interested in knowing how you hawve been able to brand your website aand enure visitors. Very helpful i was going crazy trying to get node.js to work, thanks a lot.